If you are looking for a tropical getaway where you can spend your hard-earned Starwood miles and reward yourself with a well-deserved vacation, head to the W Retreat and Spa in the Maldives. A small private island surrounded by the Indian Ocean, the property offers just 78 private suites and villas on the beach or on the water. Guest accommodations are built to offer the best views of the blue lagoon and the ocean. You can stay right on the beach or in one of the overwater retreats on stilts over the lagoon. Each suite and villa has its own plunge pool and a plush outdoor daybed with plenty of privacy. The two-bedroom Ocean Haven Villa is the most impressive, offering an incredible overwater living room with glass floors that let you look down into the pristine blue ocean. 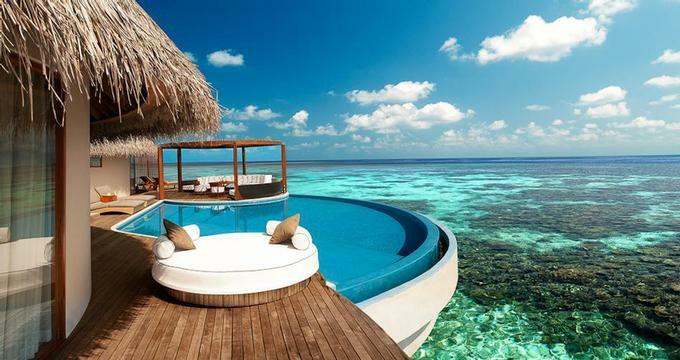 The villa has a huge deck with a pool that hangs over the Indian Ocean. Custom furnishings inside and out, a thatched roof and panoramic views create the perfect atmosphere for relaxing and unplugging. The king signature W bed under the cathedral ceiling makes it easy to fall asleep and a pleasure to wake up. The luxury villa bathroom has a circular bathtub and Bliss Spa bath amenities. The Ocean Haven Villa living room has two cozy sofas, a desk and a 42-inch TV. Floor-to-ceiling class doors slide open to let in soothing ocean breezes. The outdoor circular lounge is perfect for sipping cocktails and light snacks right over the water. Jump into the pool to cool off during the day. The daybed is perfect for relaxing with views of the blue horizon. While you may be tempted to never leave your princely abode, the rest of the resort beckons with white sandy beaches, a great spa, snorkeling, scuba diving and romantic dining. Away Spa offers four treatment villas and a relaxing menu of treatments in a stunning overwater setting. The spa offers massages, Ayurvedic treatments, body therapies and facials. Sign up for a Robinson Crusoe-style experience and spend a night on your own private island. Gaathafushi, operated by the hotel, is an intact tropical island that can be rented by a lucky couple. This is one-of-a-kind honeymoon experience, complete with a romantic candle light BBQ with a private chef. Overnight stays on Gaathafushi start at US $3,500 per night, half-day escapes from US $500. Click here for more great honeymoon ideas. The resort's yacht Escape is available for romantic sunset cruises, day charters and overnight sails to the south of Ari Atoll for incredible scuba diving and snorkeling. The private island offers a selection of restaurants, bars and a nightclub, designed to take advantage of the beautiful scenery. Sip cocktails with spectacular sunset views, either from the beach or over the water. Nightly rates start at USD $960 per night with breakfast. Next Read: 15 Breathtaking Overwater Pools and 24 Most Outrageous Ocean Views from Your Hotel Bed.